Ragtime occupies a foundational position in the evolutionary roots of jazz, and Scott Joplin is its high priest. Rags and Roots is a bi-hemispheric ragtime revival that marks the centenary of both Joplin’s passing and the first noted jazz recording. By reimagining ragtime and the roots of jazz, Chris Washburne has created a path for new audiences to discover this quintessentially American music. 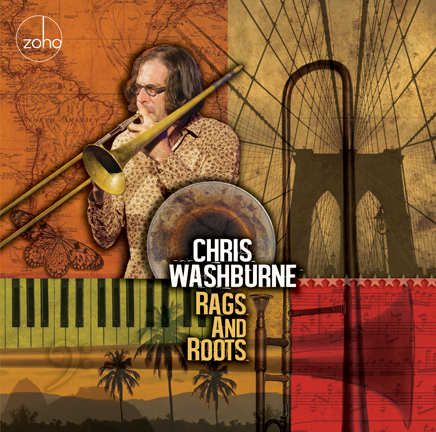 His Rags and Roots is both a tribute to and triumph of ragtime and a sounding out of the truly global roots of jazz. This album embraces and sounds out the remarkable cultural diversity that contributed to the emergence of jazz. Maple Leaf Rag: The album opens with the profoundly influential composition by Scott Joplin (1867  1917) that has become the embodiment of ragtime. 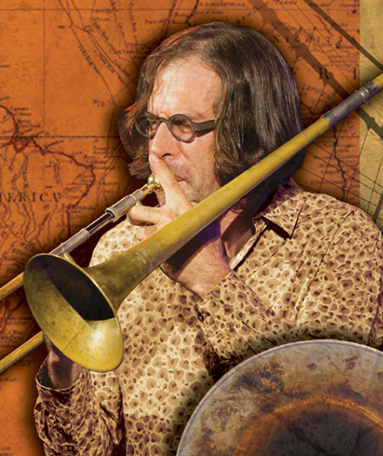 Washburne transforms Maple Leaf Rag into a multi-stylistic romp that pivots effortlessly between modal and Dixieland elements, exploring the contours of the original using musical forms that may owe their existence to Joplin’s pioneering genius. The rarely sung lyrics, which Sarah Elizabeth Charles sings on this track, describe a poor man from the country dressed in rags who finds himself in an elegant dance club with higher-class patronsan establishment Joplin played in the mid 1890s in Missouri called the “Maple Leaf Club.” His prowess at the new dance called “the Maple Leaf Rag” incites violence among the men and intrigue among the women in attendance. Washburne’s expansive arrangement sails along, reinforcing the energetic arc of the narrative. In 1931, Los Hermanos Castro, considered the original Cuban big band, combined St. Louis Blues with The Peanut Vendor to create one of the first cross-stylistic mash ups in Latin jazz history. In Washburne’s artful reimagining of the piece, The Peanut Vendor is given more weight than in the original, and in the process, the two-chord vamp of the Simons tune is transformed into the blues-montuno. Bamboula: Although Louis Moreau Gottschalk (1829  69) is regarded as an American composer and musician, he spent most of his working career outside of the US, traveling throughout the Caribbean between 1853 and 1862. He was also one of the first to transcribe African slave music. Bamboula was a racy slave dance named for the bamboo and skin drums used to keep the beat during its performance, which occurred frequently in New Orleans’ Congo Square in the years leading up to emancipation. Evan Christopher’s jubilant interpretation acknowledges both the cultural origins of the music and Gottschalk’s classical spin on its themes, combining virtuosic piano solos with playful brass and woodwind riffs tethered to pan Caribbean and New Orleans rhythms. Here’s One: Pioneering Harlem Renaissance giant William Grant Still (1895  1978) is referred to as the Dean of African American composers. Yet Still’s legacy as a prolific and skillful arranger is equally impressive, having worked with the likes of W.C. Handy, James P. Johnson, Paul Whiteman, Artie Shaw, and Dmitri Tiomkin. Still was also an early champion of the spiritual as a serious musical art form, and his arrangements of traditional songs like Here’s One helped foster wider recognition of their cultural significance. Washburne’s delicate arrangement showcases the simple power of the melody and provides ample space for Vuyo Sotashe’s emotionally charged vocal performance. Solace (A Mexican Serenade): Written in 1909, Solace is one of Joplin’s most beautiful melodies, and its subtitle and melodic feel demonstrate the composer’s appreciation of the diverse cultural traditions that underlay early jazz styles. Even in solo piano renditions of the song, one can hear the mariachi trumpets that are so prominent in Mexican music and which were making their presence felt in turn of the century New Orleans. Washburne gives full scope to the song’s pan-cultural dimensions, creating what is a serene ballad paired with a vibrant Cuban groove. Odeon: Though ragtime was fundamentally North American, similar musical traditions emerged simultaneously elsewhere in the New World. Ernesto Nazareth (1863  1934), who has been called the “Joplin of Brazil,” was perhaps the greatest composer in the Brazilian style called tango brasileiro. Like Joplin’s Maple Leaf Rag, Odeon was inspired by a venue familiar to the artist, in this case the Odeon Cinema; Nazareth had performed in the waiting room of the luxurious theater, drawing great crowds, and this became one of his most famous compositions. Picture of Her Face: Joplin the internationalist is on display in this rag that was written as a traditional Irish folk tune, both in terms of its melody and lyrics. Washburne’s arrangement reveals the somber Irish soul behind the original song’s ragtime jauntiness by slowing the tempo and emphasizing the plaintive vocal element. Mildly Entertained: As popular as Scott Joplin’s music had been during his lifetime, it was Marvin Hamlisch’s recording of “The Entertainer” and five other Joplin ragtime classics for the soundtrack of the blockbuster 1973 movie The Sting that kindled a lasting appreciation both of ragtime and of its master practitioner. Using “The Entertainer” as a launching point, Washburne adds his own original composition to the Joplin template that suggests ragtime with a contemporary jazz aesthetic. Ala Cote Gen Fanm: Early jazz traveled quickly throughout the world with many locally inflected unique styles. In Haiti, jazz was combined with rhythms from Rara and Voodoo traditions and was known as Voodoo jazz. Composed by Gerard Dupervil (1933  1994) and made famous by the group Jazz Des Jeunes, the original lyrics were typical of Rara music in their misogynistic outlook, but for this arrangement were adapted by Candice Hoyes and Sarah Elizabeth Charles to embrace a female perspective. The result is a feminist anthem, sung in Haitian Creole, which is a reverent nod to the original musical styles involved and an acknowledgment of the many obstacles faced by the founding mothers of jazz on their climb to artistic equality. Lisette: A Haitian Creole song composed by a white planter around 1790, during the Haitian slave uprisings, and was possibly inspired by his love for one of his slaves. Remarkably, the piece gradually evolved into a popular folk song associated with black culture, and its irresistibly poetic lyrics are credited with helping sway the decision to make Creole the official language in Haiti. Washburne’s free interpretation renders the melody as a trio for piano, clarinet, and trombone. Creole Belles: Composed in 1900 by Jens Bodewalt Lampe (1869  1929), a Danish-born American composer of ragtime, Creole Belles quickly became one of the biggest hits of its day, especially after John Phillip Sousa recorded it in 1902. Evan Christopher chose a traditional arrangement as a celebration of New Orleans culture and of the soundscape from which early jazz emerged. Kabir Sehgal is a GRAMMY & Latin GRAMMY Award winning producer. Recorded at: Second Story Sound in New York City on September 23rd and 24th, 2016. Engineer: Jeff Cook. Production Assistant: Beth Pratt. Mixed at: Avidon Audio Labs by Dev Avidon. Mastered at: Engine Room Audio by Andy VanDette. Liner Notes: Kabir Sehgal. Art direction and package design: Jack Frisch. Producers: Chris Washburne, Kabir Sehgal. Executive Producer: Joachim “Jochen” Becker.